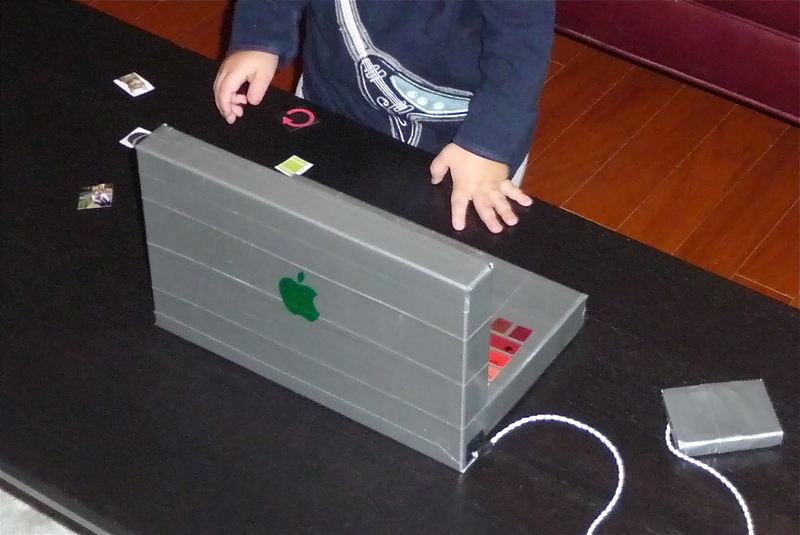 Last weekend I made my son his very own MacBook Pro! Though it’s far from being a stunning home decor item, it is a pretty cute kid toy and I’m proud to call it one of my most worthwhile crafts. See below how it was accomplished, step by step. The little man getting to work! *Velcro has two parts – “soft” and “spikey” — know what I mean? For 99% of this you’ll use spikey, so unless I otherwise say “soft” use the “spikey side.” A little velcro goes to waste, but hey, it happens. See -- it's a real Apple product. 2.) Cover every surface of both boxes in silver duct tape. Thankfully, duct tape can be lifted and re-applied a few times, and it can be pretty cleanly patched with small pieces if you miss a spot. 3.) 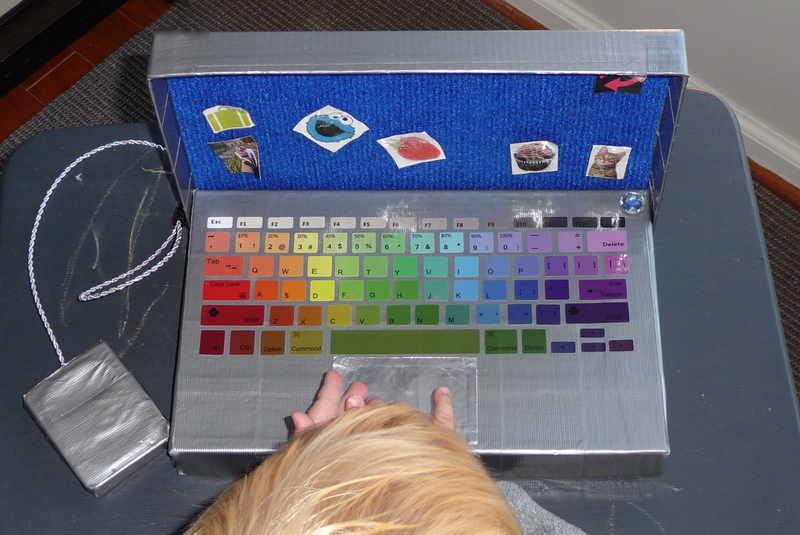 Apply the keyboard decals to the outside surface of the smaller box (this part was the bottom of the shoe box). You may recognize the ones I use as the decals I admired in an earlier post here. Don’t be fooled, they came rife with misspellings (“Commond”) but have been a great added touch to this project. 5.) 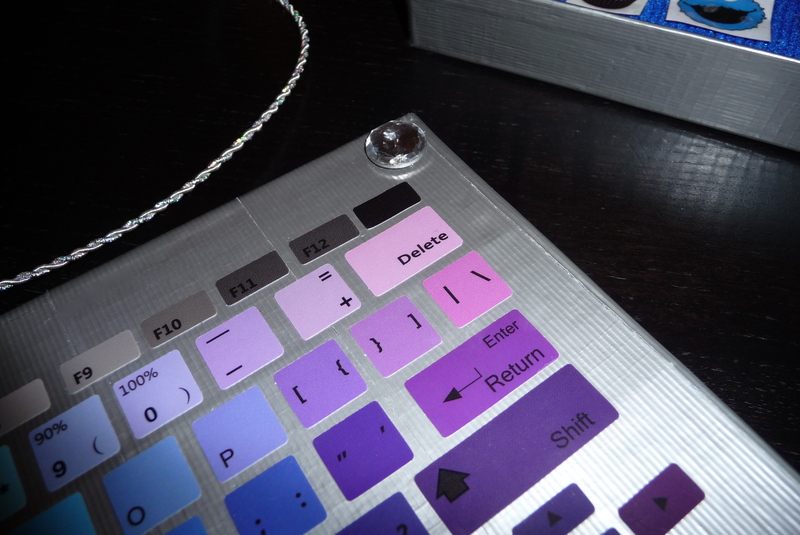 In the upper right hand corner of the keyboard, super glue a small rhinestone or button. This is the power button. It was important for me to make this part flashy, because it’s the part of my MacBook that my son is most attracted to and I want him to press HIS and not mine. Also, I know super glue seems like a little much but the power button is a huge choking hazard, so it needs to be secured safely. 6.) Cut a piece of ribbon about 18 inches long and securely duct tape the end to the inside of one baby food lid. Set the other lid on top to form a tiny box enclosure, and seal it up so that the entire thing is covered in duct tape. 7.) On the other end of the ribbon (the part not enclosed in the baby food lids), take a little piece of the spikey sticky velcro and roll it around the ribbon. The sticky backing will help it attach, but a needle and thread through the cord ribbon and velcro a few times will seal the deal. As with the power button, securing this little piece of velcro is important because small pieces are choking hazards. 8.) Attach a small piece of the soft sticky velcro to the outermost part of one of the short outside edges of your “screen” box. Stick the “cord” to the “screen” and you’ve completed your breakaway power charger! 9.) Using a strong glue or fabric glue (I used Sobo), cut a piece of felt the exact size of the interior of the larger box and glue it down. Use a lot of glue, press it down lightly, and don’t touch it for about 24 hours. Make sure that you expose the side of the felt that works best with velcro, because sometimes felt can be slightly different on both sides. 10.) 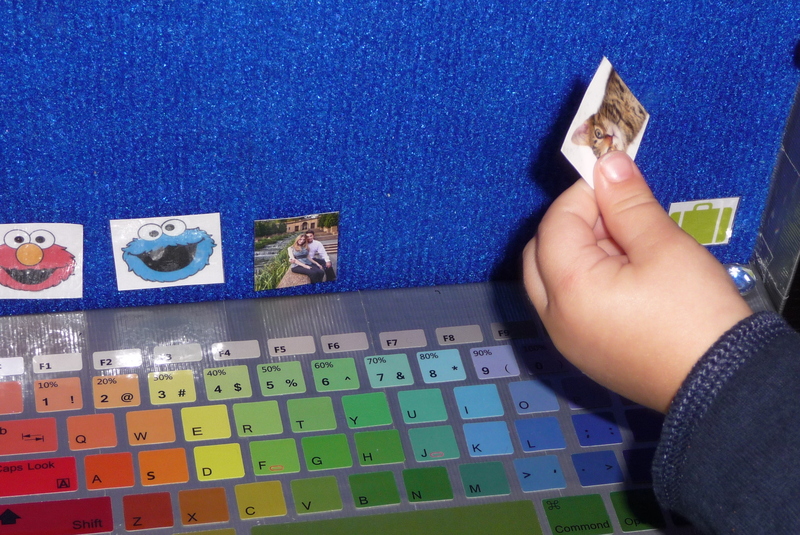 Cut out your velcro “stickers.” We used Elmo, Cookie Monster, a cat, a strawberry, a tiny engagement picture of ours, a suitcase, a cupcake, and a little arrow symbol. Cover the front and back in clear packing tape a few times (laminating at home!) and cut them out cleanly. Attach a tiny piece of spikey velcro to the back, and you’ve got a sticker ready to go on the screen. Repeat as many times as you want icons, and get ready to make these over and over as your kid attaches them to the dog, loses them in his cereal, and crinkles them into tiny bits. 11.) Nest the keyboard into the screen at a 90 degree angle (as shown) and there you have it – a tiny MacBook Pro! I’d definitely recommend that once your felted screen is dry and ready for play you militantly supervise the first few uses to watch for slight imperfections and loose tape. Other than that, this has been pretty durable for us so far. I hope your kid enjoys it, and that you enjoy making it as much as I did! ← I’ll Tell You This: One Kings Lane is Life Changing.